The VP-MERV 8A Pleated filter achieves MERV 8A efficiency with low resistance to airflow per ASHRAE 52.2. Its filtering medium does not rely on electrostatic charge to capture particulate which will dissipate over time and during use. The VP-MERV 8A Pleated filters can upgrade existing flat panels, as well as competitive MERV 6-7 pleated filters. Filters are available in 1, 2 and 4-inch depths. 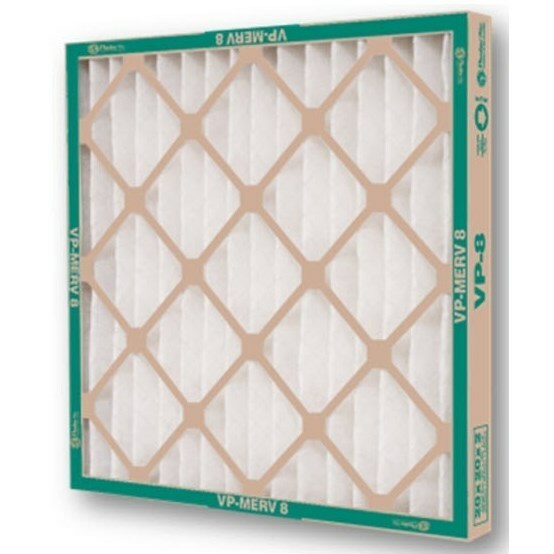 VP-MERV 8A Pleated filters are available in a wide range of sizes and will fit most commercial and industrial installations with little or no system modification. Fasteners are available to adapt the filter to existing filter banks.